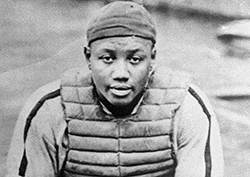 The stories about Josh Gibson carry a mythical, Babe-like aura. There was the time Gibson hit a line drive inches above pitcher Satchel Paige's head during a game at Yankee Stadium -- and the ball zoomed over the center-field wall. Or the time Gibson knocked a speaker off the roof at old Comiskey Park with a searing shot to right-center. Or the many times Gibson's blasts scattered kids perched in trees beyond the center-field fence at Griffith Stadium, a good 500 feet from home plate.